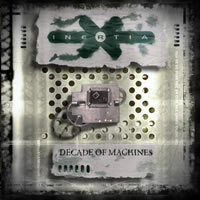 ''Decade Of Machines'' sees UK electro / industrial act Inertia finally releasing a double CD collection of 29 essenial tracks spanning their illustrious career between 1994 and 2004. One of the first bands in the early 90's to incorporate dance, trance and techno influence into the dark music scene, this collection features deleted / out of print cuts from their early period alongside songs from their stints with the German Celtic Circle, Khazad Dum and Nightbreed labels plus more recent material from their last albums released on the bands' own Cryonica label. Presented in a double jewel box with black slipcase this nicely packaged compilation is a must for any collector or anyone interested in sampling the band's unique form of Electro Industrial Music.